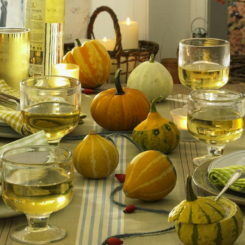 Thanksgiving is a holiday filled to the brim with family, friends, and food. 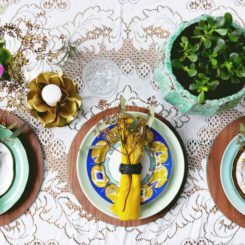 If you’re blessed to be hosting this year’s Thanksgiving dinner, you might be looking for ways to change up your tablescape while still keeping things simple. 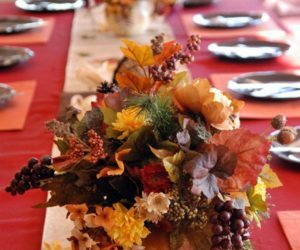 In this article, we’ll look at a variety of ways to set each place as well as decorate with some simple, modern Thanksgiving centerpieces. Ultimately, we all want to focus on the people, not the things. Happy Thanksgiving. 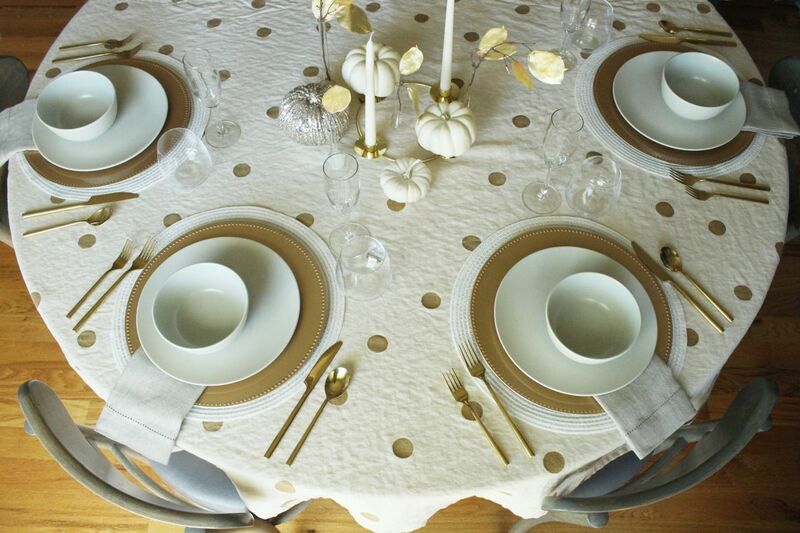 There is a certain satisfaction that stems from having a very neutral and tight color palette for your Thanksgiving feast, particularly when you consider the variety of edibles that will soon be “decorating” each setting anyway. With such a tight palette, the use of layers is important here. 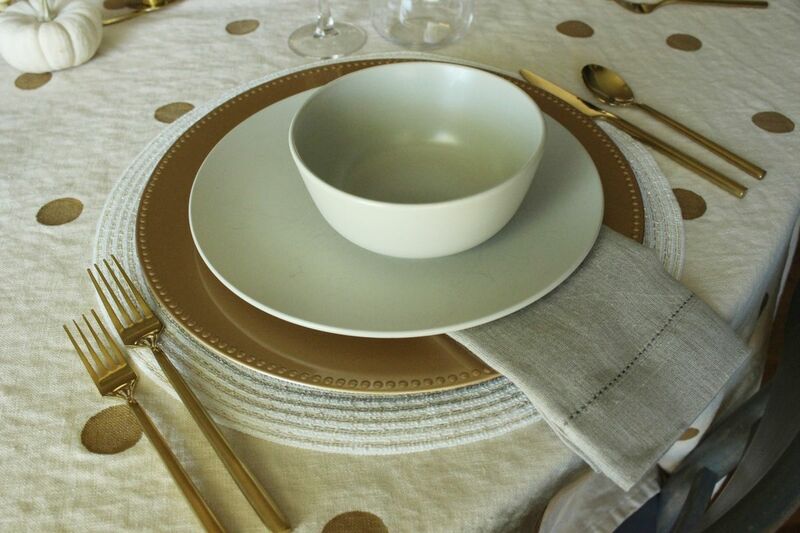 Round cream and gold woven placemats lay the foundation to the rest of the dishes, which include large gold platter plates (from the dollar store), cream dinner plates, and cream bowls. 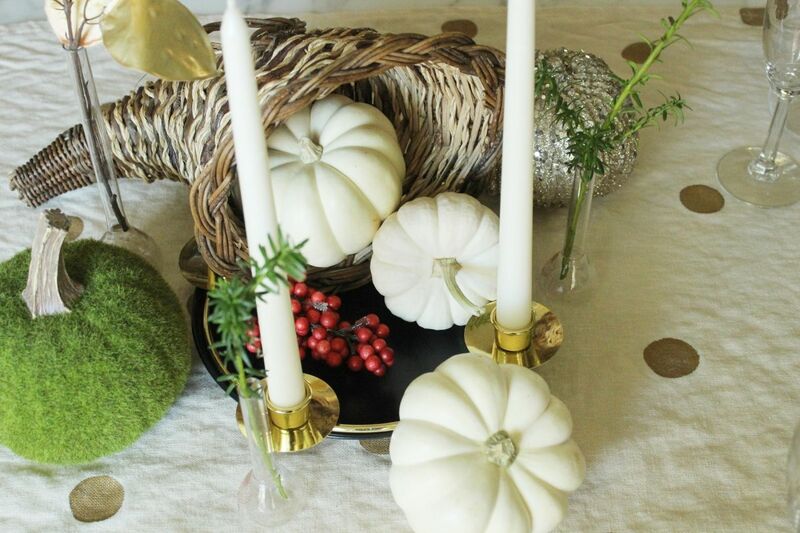 The centerpiece holds to the cream and gold color palette as well, with a special emphasis on the use of white mini pumpkins. 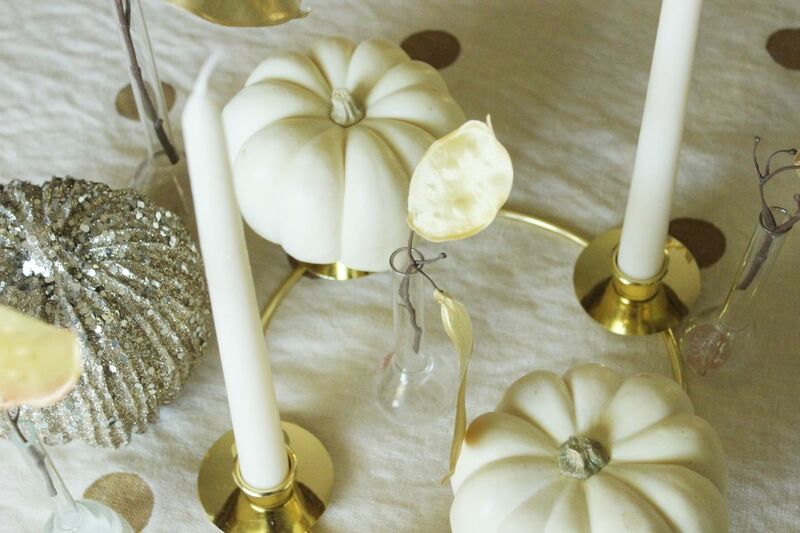 A gold candelabra holds not only white taper candles, but also serves as pedestal for a couple of the pumpkins. 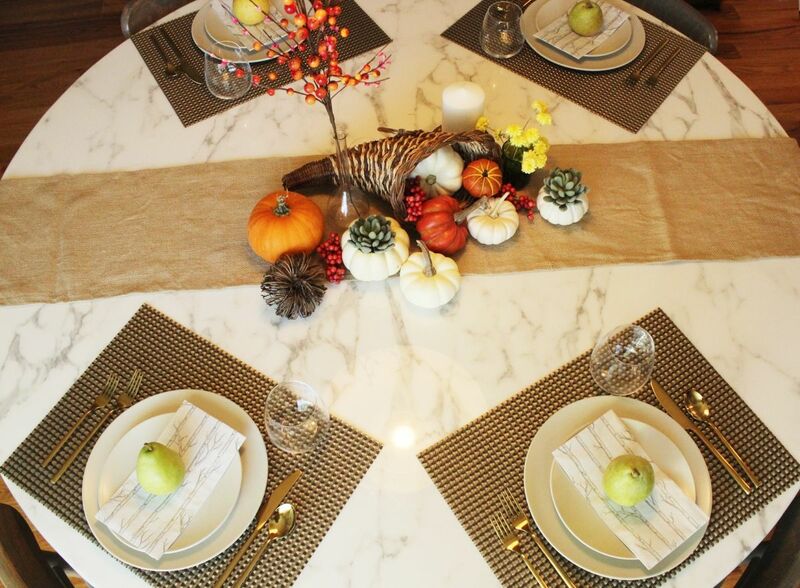 One detail to consider as you set your Thanksgiving table is shape – the centerpiece can mimic the settings (in this case, circles) quite effectively for a seamless table. 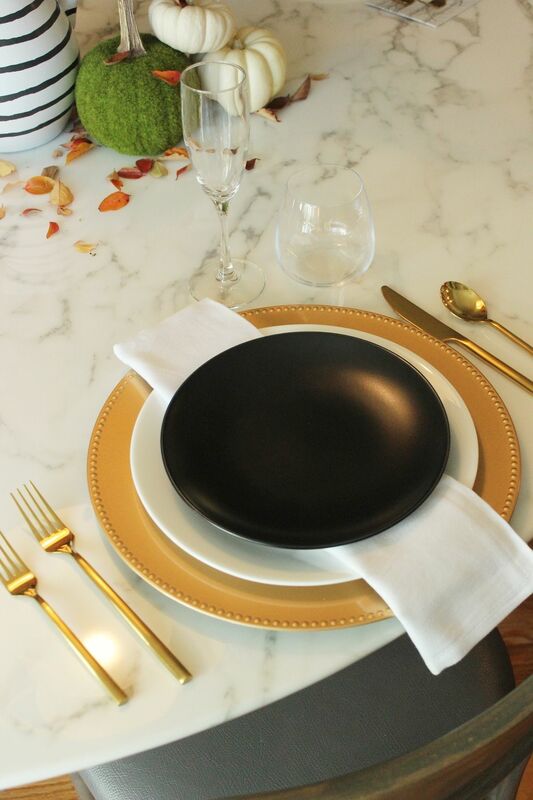 You can add drama instantaneously to your Thanksgiving table settings, as well as modern elegance, with a touch of black. 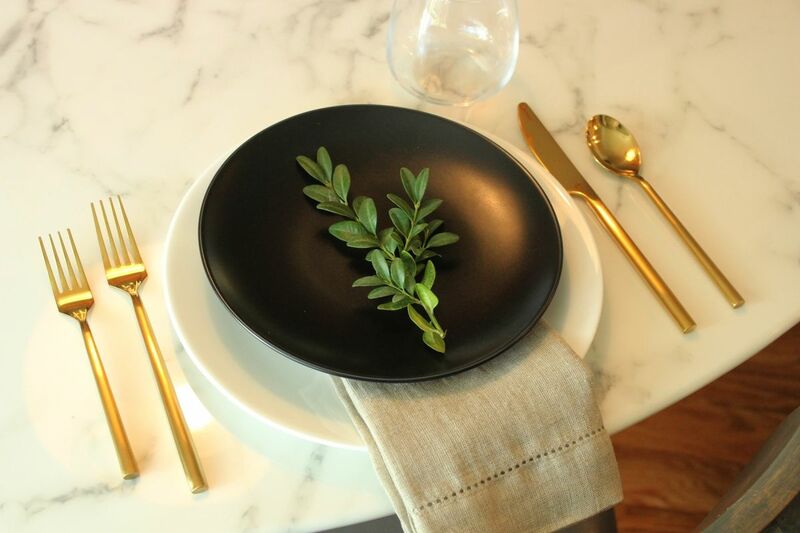 These matte black salad plates provide a lovely touch of sophistication. An evergreen sprig, trimmed off a bush from the front yard, coupled with a bit of red berry look cheerful and lovely against the black plate. 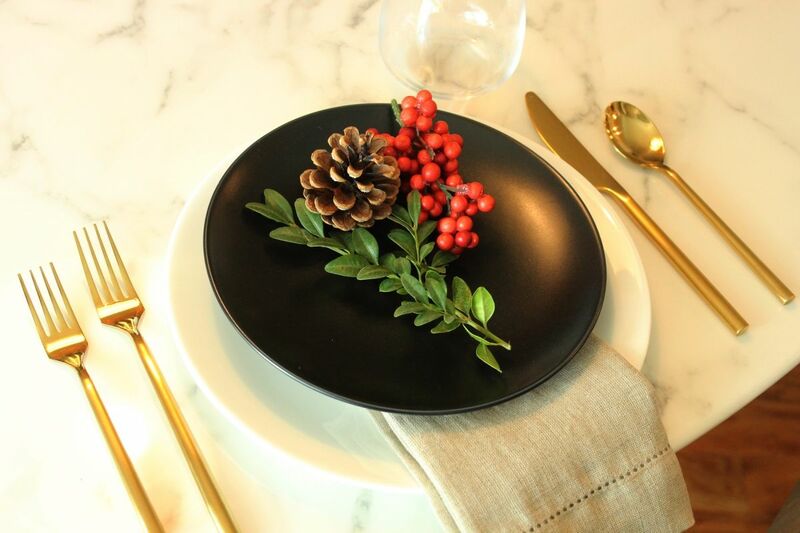 Of course, when you add in a bit of black at the table settings, you’ll probably want to include at least a little black in the Thanksgiving centerpiece to help the tablescape look and feel more cohesive. 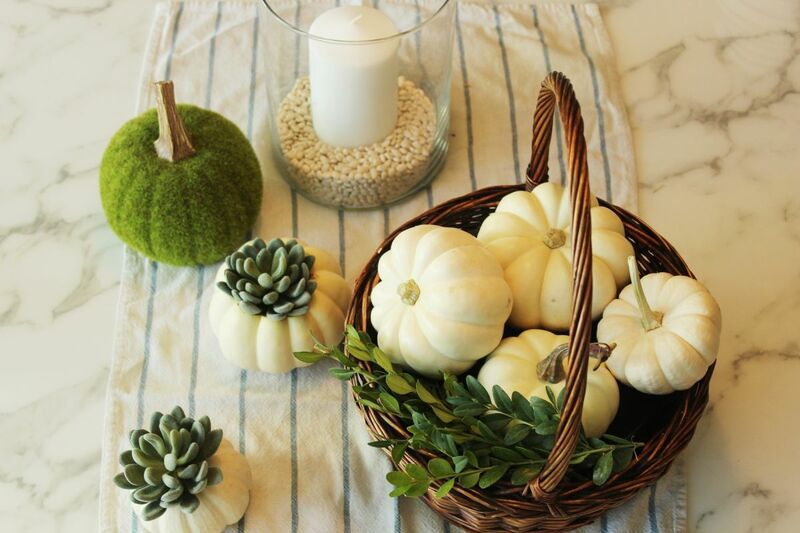 A bit more red and green, in the form of a fuzzy green craft pumpkin, help the centerpiece balance with the settings themselves. 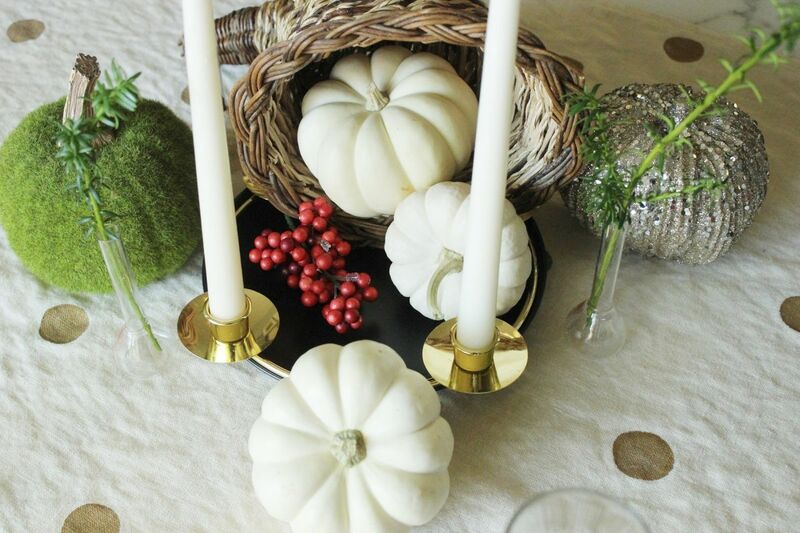 And an extra black plate under the candles is a subtle, yet important, detail to add to the mix. 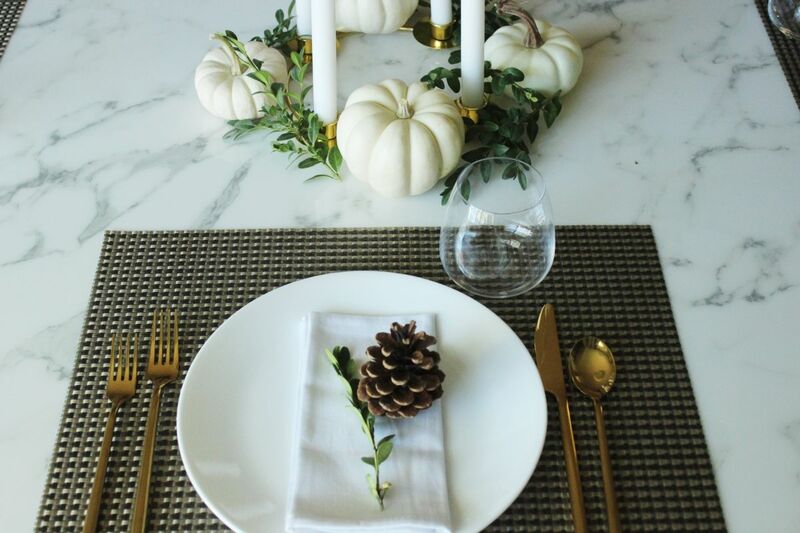 If you’re looking for a staple for Thanksgiving dinner centerpieces, I would highly recommend a medium-sized cornucopia, or horn of plenty, in a neutral weave. 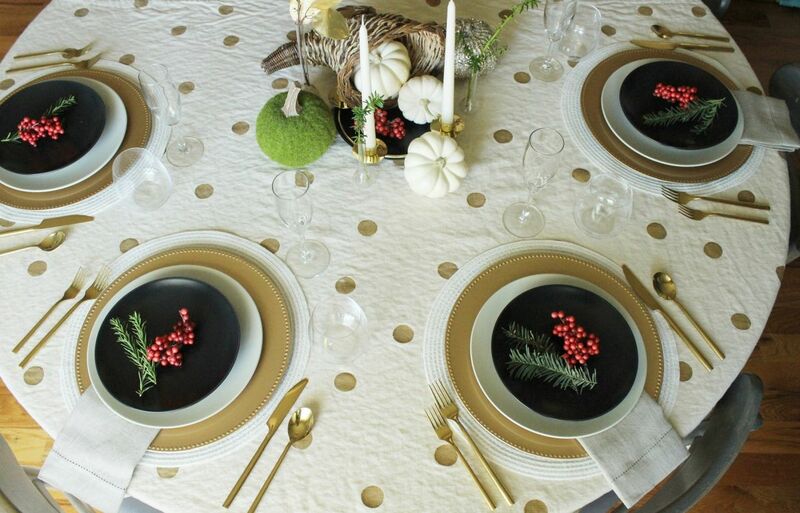 The decorating possibilities with this basic are generous, as is the visual reminder of Giving Thanks. 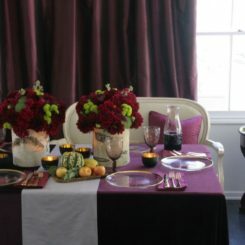 This Thanksgiving look is contemporary; I personally enjoy the blend of holidays here. 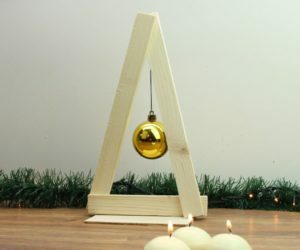 The evergreen and berries feel like a lead-in to the Christmas season, but without jumping too far too fast. 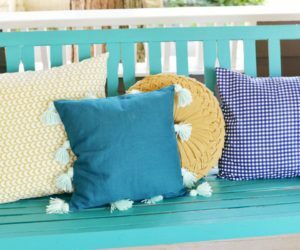 This color combination is just about as classic as it gets. 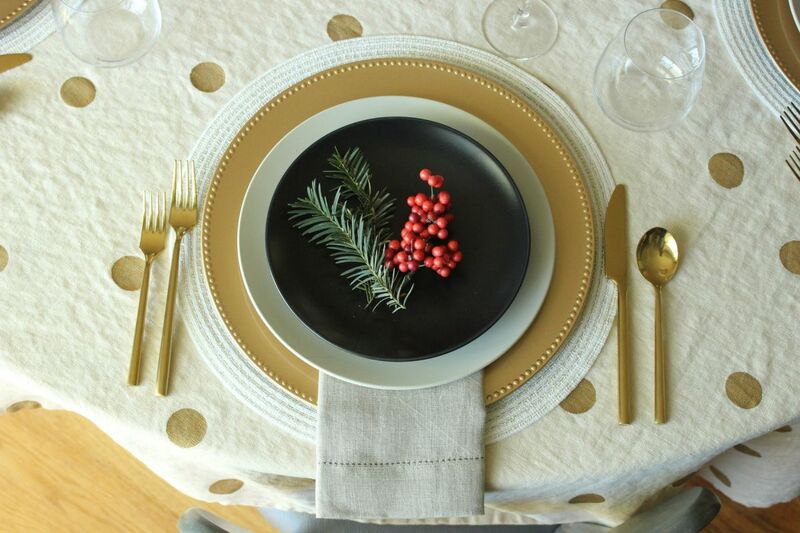 Gold flatware is key in a combination like this, while a touch of green helps it to feel approachable and natural. 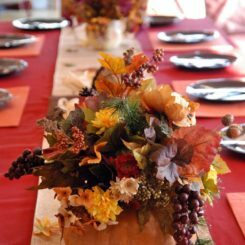 If you enjoy simplicity and want your job to be as easy as possible, consider having your Thanksgiving centerpiece completely mimic the place settings themselves. Layer the bases the same way, and keep the colors the same. 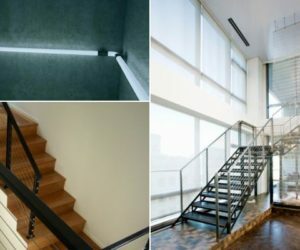 Make an otherwise identical place feel slightly different by placing items off-center. 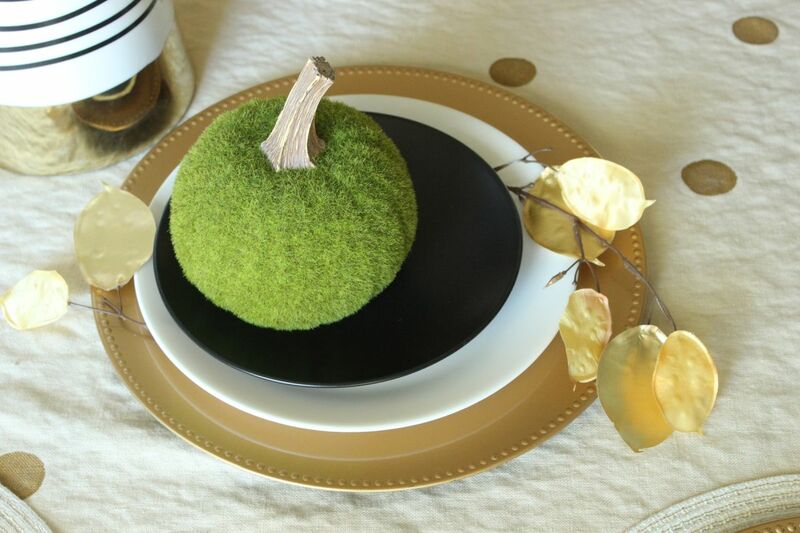 Green pumpkin on one side of the layered plates and gold leaves on the other side creates a nicely balanced centerpiece from every angle of the table. 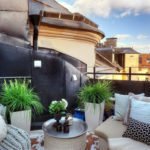 Perhaps you like to deal in more thematic décor, rather than color-based. 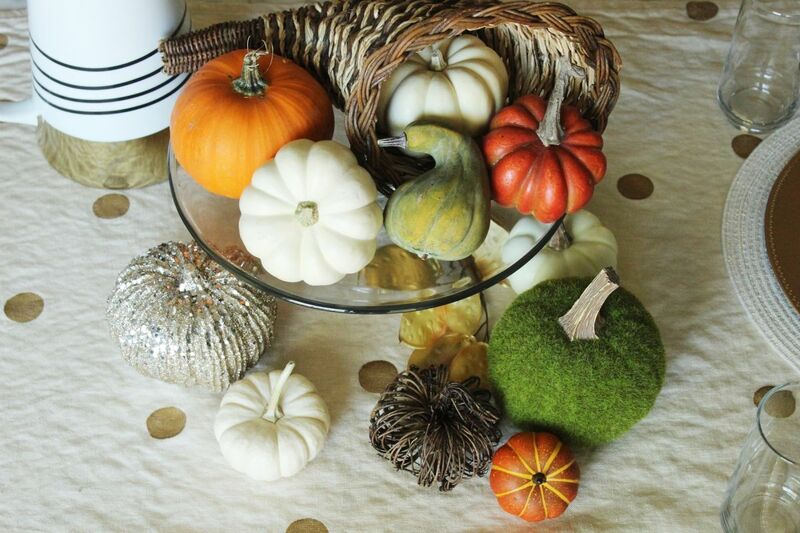 You will enjoy, then, the decoration potential of mini- to mid-sized pumpkins. 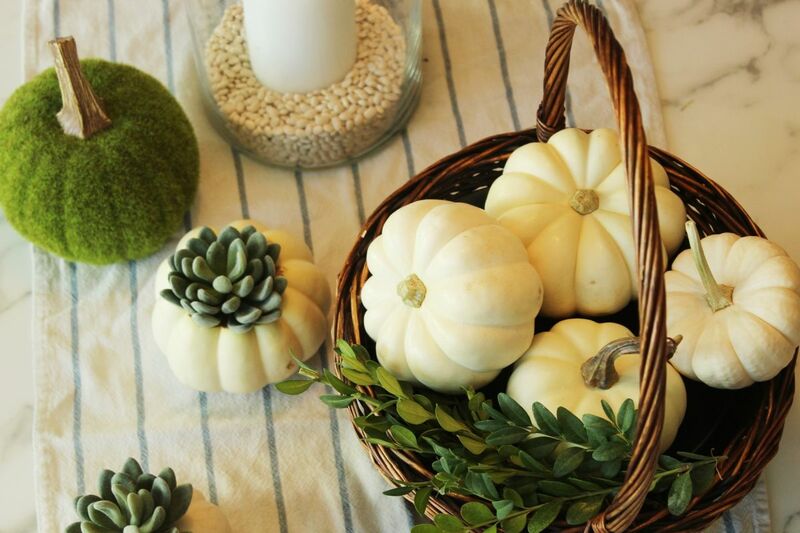 Again, spilling out of a cornucopia that’s been elevated on a glass cake stand, this centerpiece blends colors, shapes, and sizes of gourds and squashes to make a plentiful statement. 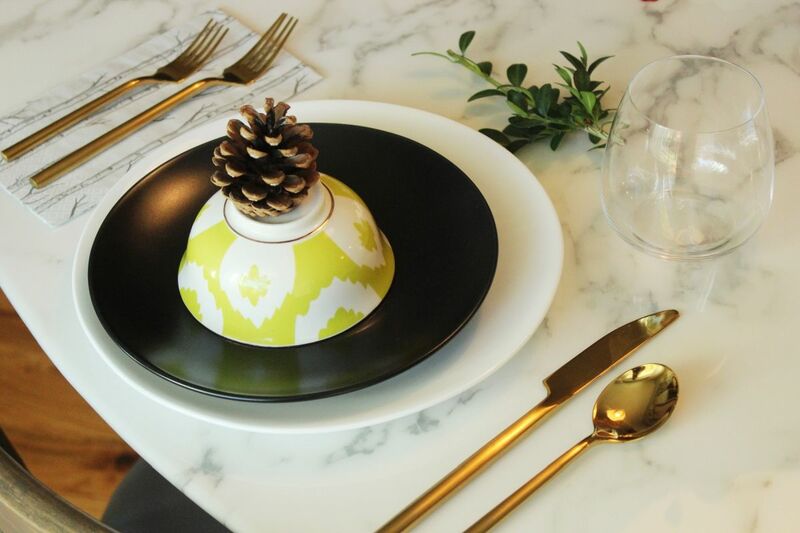 When the centerpiece is colorful, a modern balance means the place settings will be more spare in their visual busy-ness. 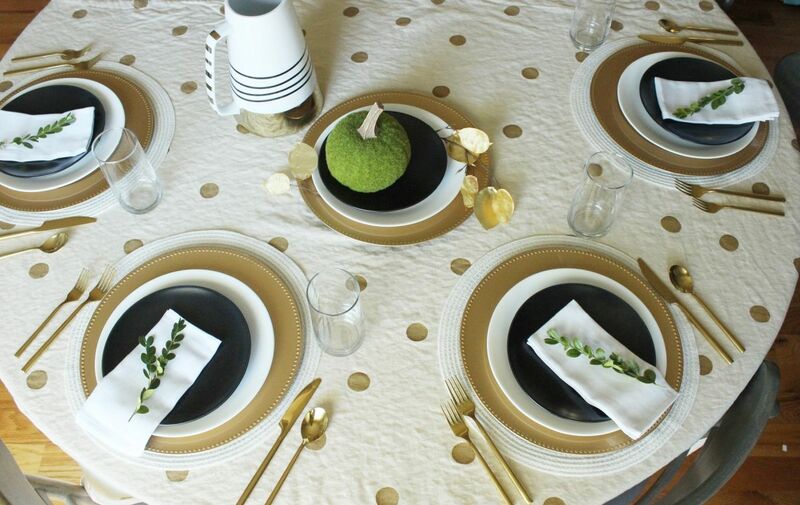 Although a DIY gold polka-dotted linen tablecloth keeps a nice transition from much (centerpiece) to less (place settings). 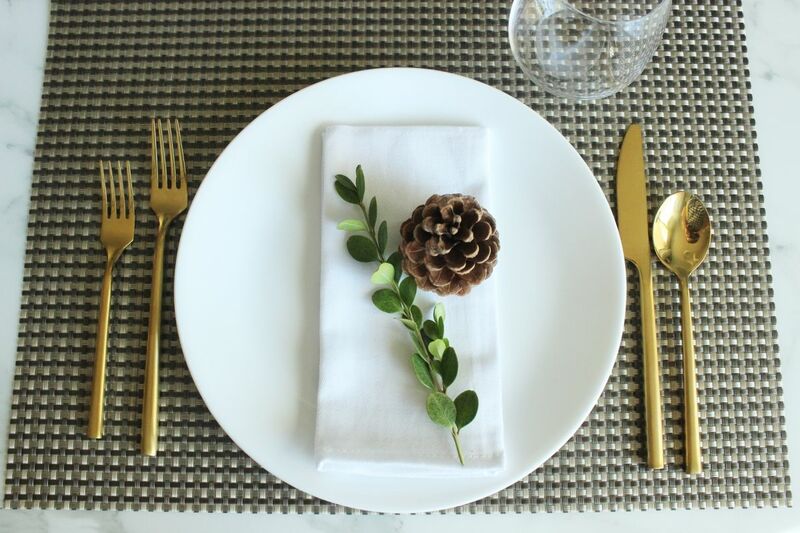 A simple boxwood sprig is a favorite decorating “tool” for contemporary Thanksgiving place settings. Setting green on top of white, as is done here on the white napkin, really makes the green stand out. 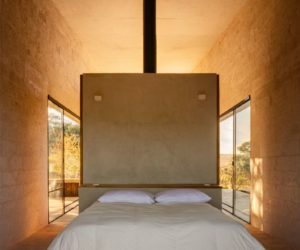 Want to go super simple? 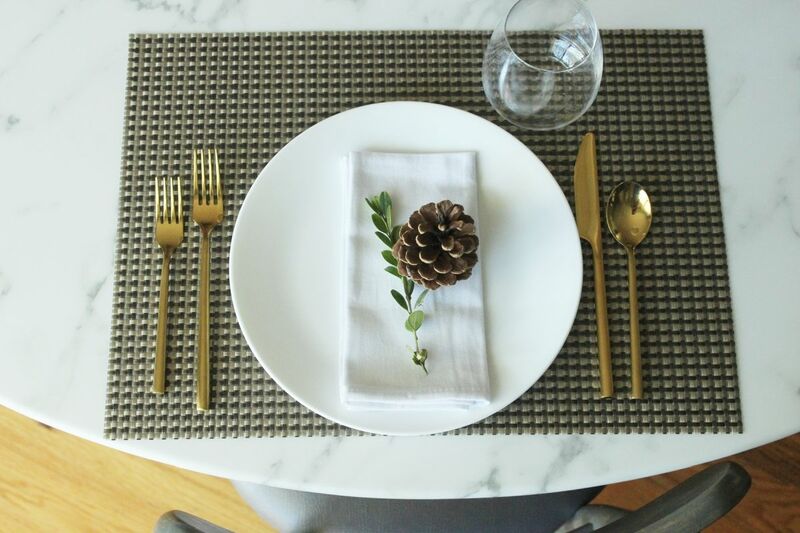 Set out a plate, a folded napkin on the plate, and stick a pinecone and boxwood sprig on the napkin. Done. 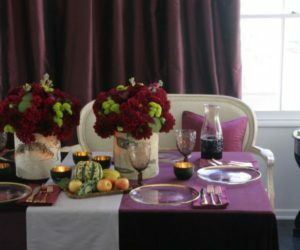 A darker tablecloth or placemat underneath the simple setting will make the simplicity feel extra special and deliberate. Which it is, of course. 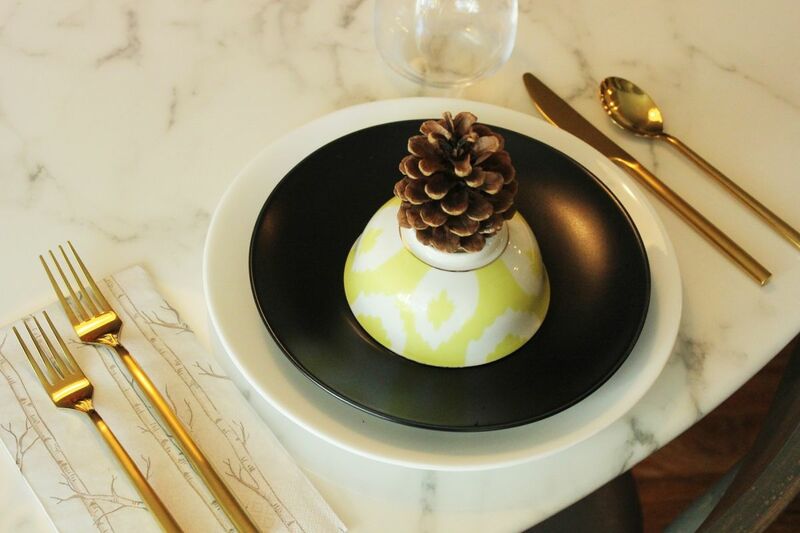 Pinecones don’t get the autumnal decorating status that they probably deserve. 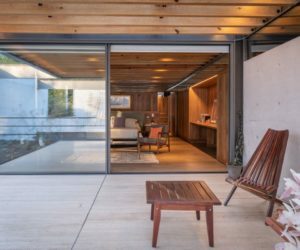 They’re a lovely, interesting shape and texture and yet maintain an unobtrusive earthy brown to work well with any décor style and color palette. 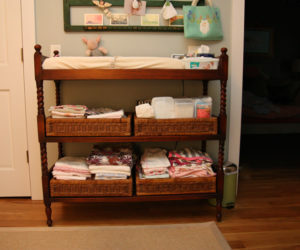 Maybe you find yourself with a decorating piece that you don’t love (perhaps most of you are good at keeping only those pieces you absolutely love; I am working on it, but until I find an adequate replacement, I tend to keep things I don’t love but can still use on occasion). 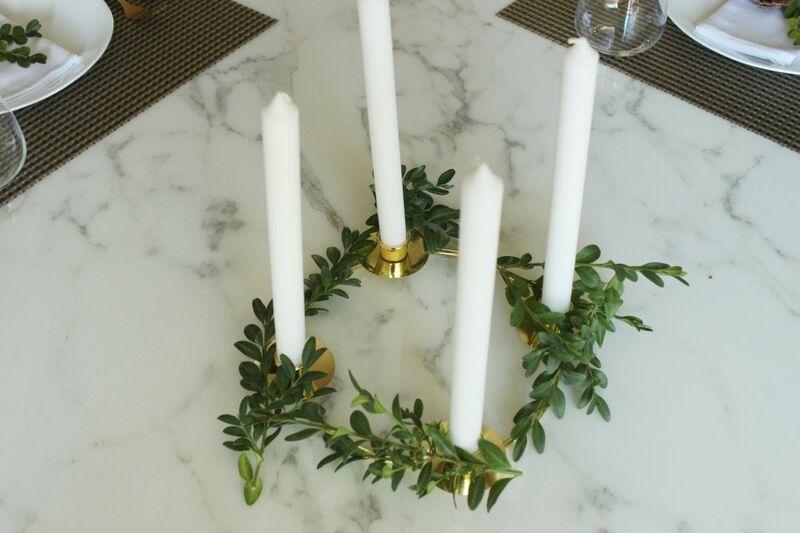 This gold flat candelabra is that way to me, so even though it’s used, it’s also camouflaged. 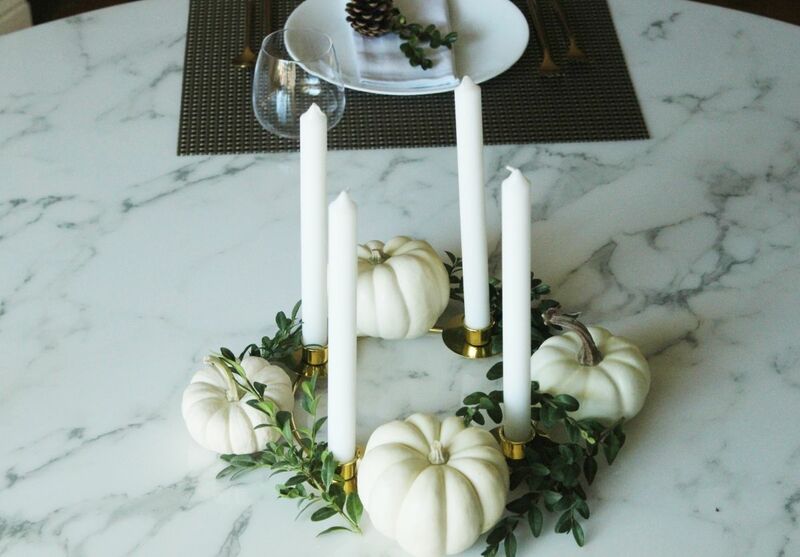 Boxwood sprigs, and even some mini white pumpkins, add a lovely distraction from the garish brassiness of this candle holder. 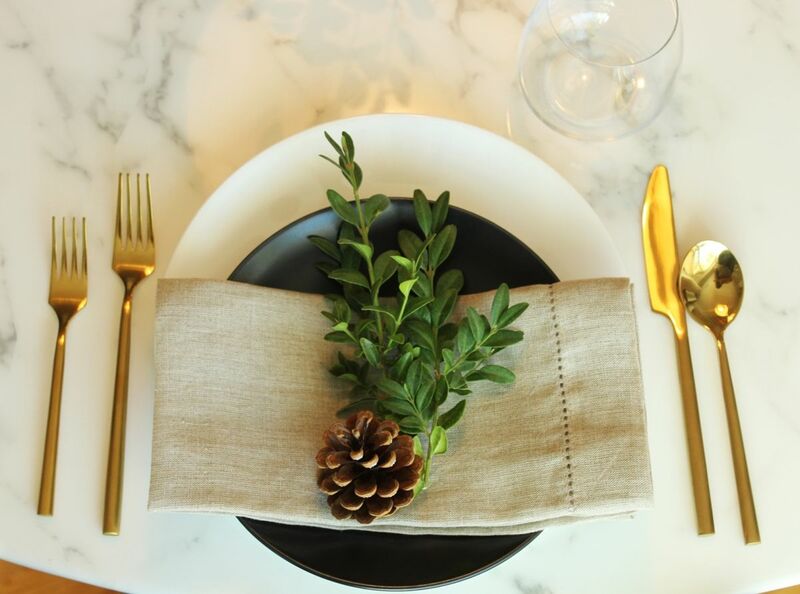 This completely simple, yet tastefully elegant, setup is one of my favorite Thanksgiving table settings. 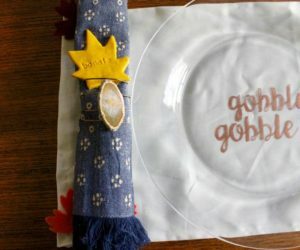 Why decorate a plate with something that just has to be removed to eat? 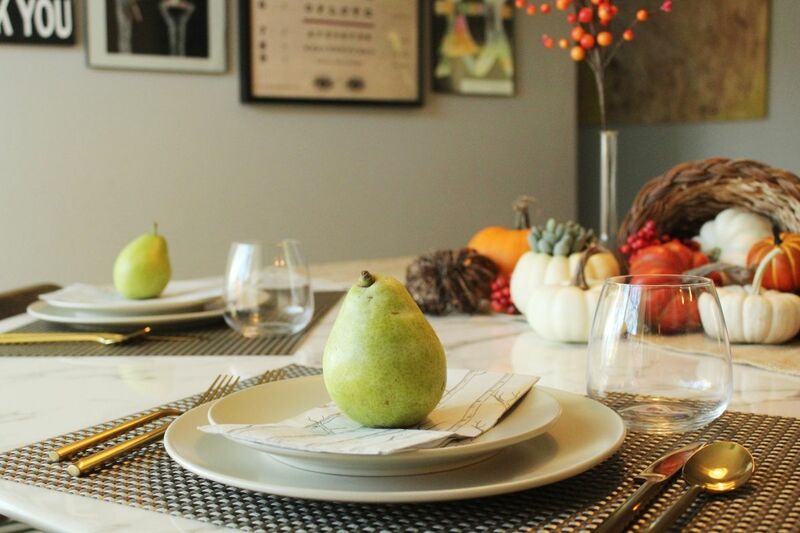 Why not decorate with an appetizer, and one as beautiful and fresh as a pear? Pears are that most beautiful shade of yellowy green that is not only appetizing, but it’s also refreshing and comforting and friendly. 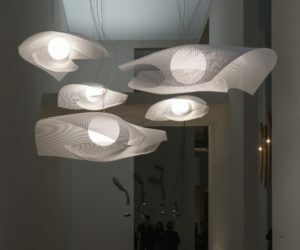 Plus, their distinct shape is endearing. 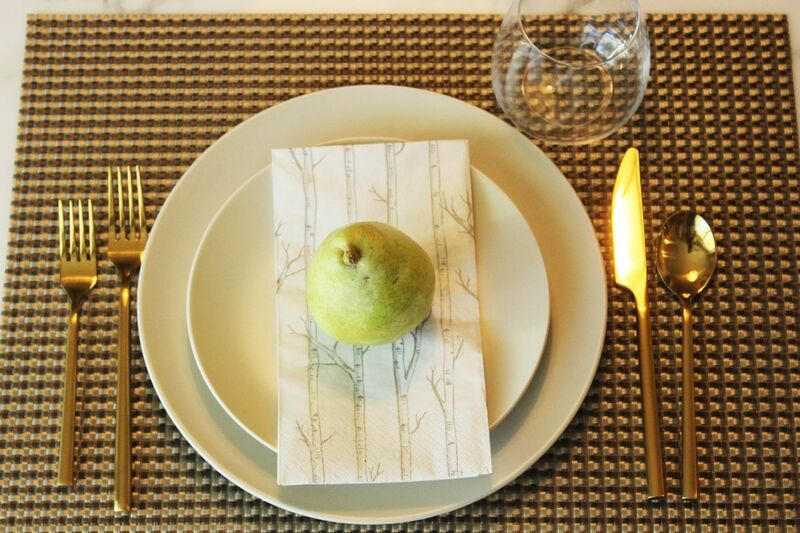 Perhaps a simple pear resting atop a printed napkin is just the thing to add visual interest to an otherwise highly neutral place setting. 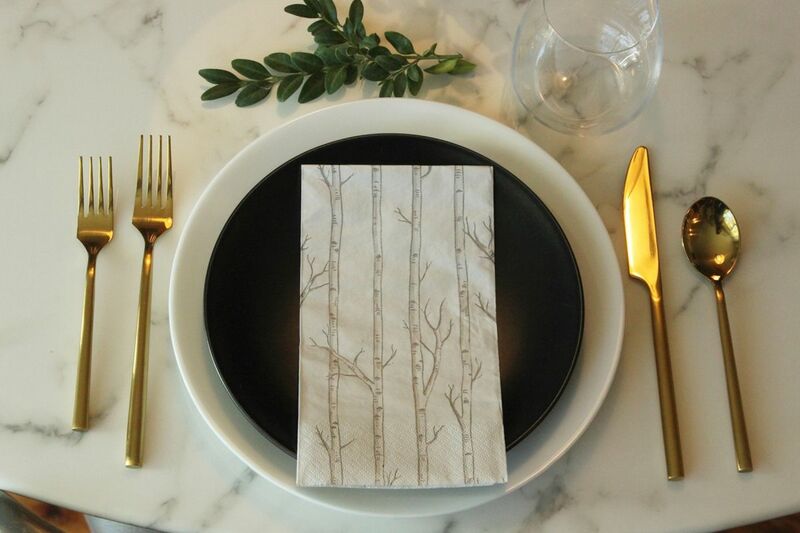 Play around with napkin placement, too. 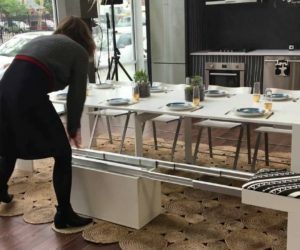 They’re fun to layer between plates, when possible, or rest right on top of the plates, or sit under the forks on the side of the plates. 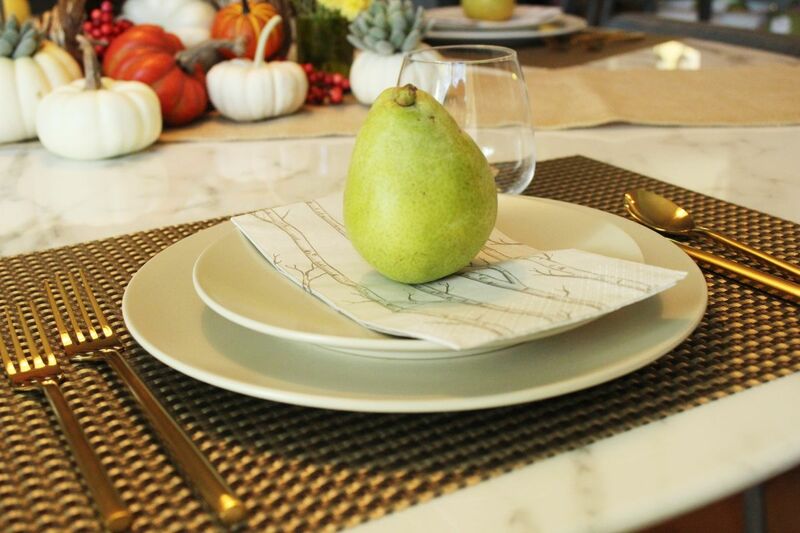 A place setting in which a pear fruit is the focus probably benefits the most from a centerpiece bespeaking harvest-time plenty. 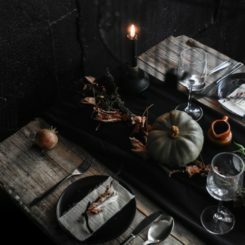 Here, the cornucopia rests on the tabletop under a burlap runner, and all the pumpkins can’t come close to being contained. 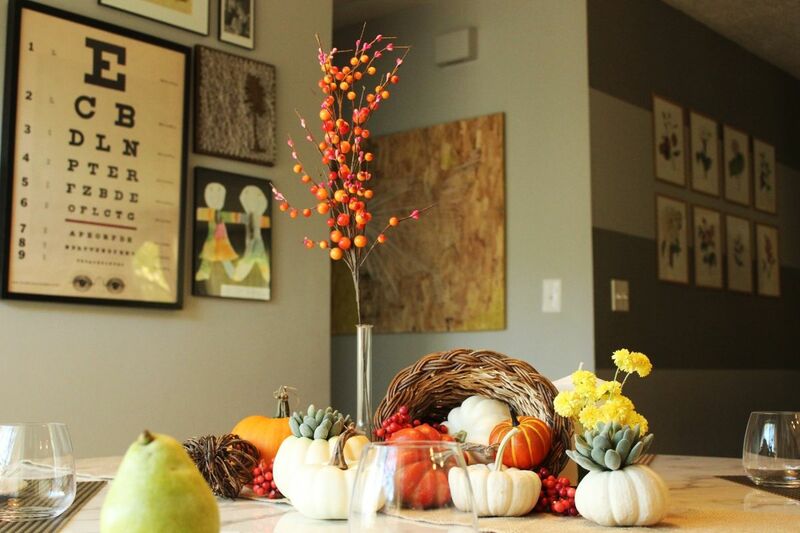 A small bouquet of yellow mums (in a DIY green glass vase), or any type of fall-time bloom, is never out of place in a Thanksgiving centerpiece. 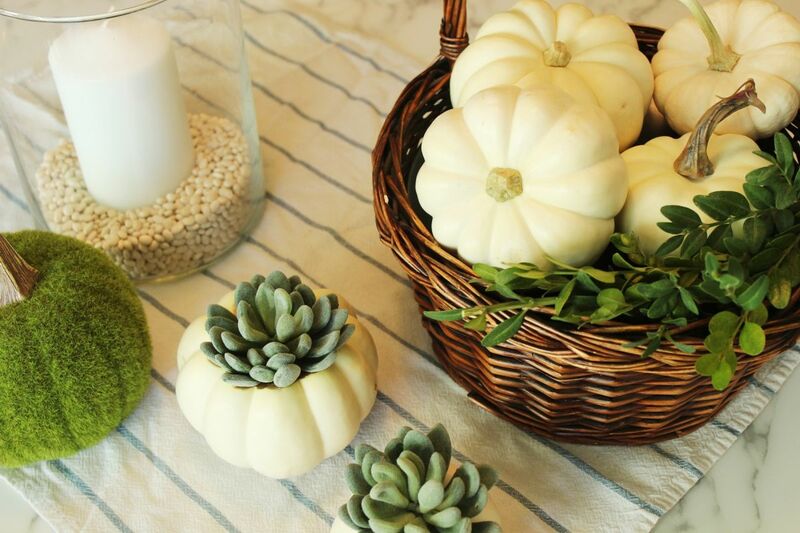 One of my favorite aspects of this particular centerpiece, too, is the DIY pumpkin succulents mixed in nonchalantly with the horn-of-plenty pumpkins. I love the gentle green. 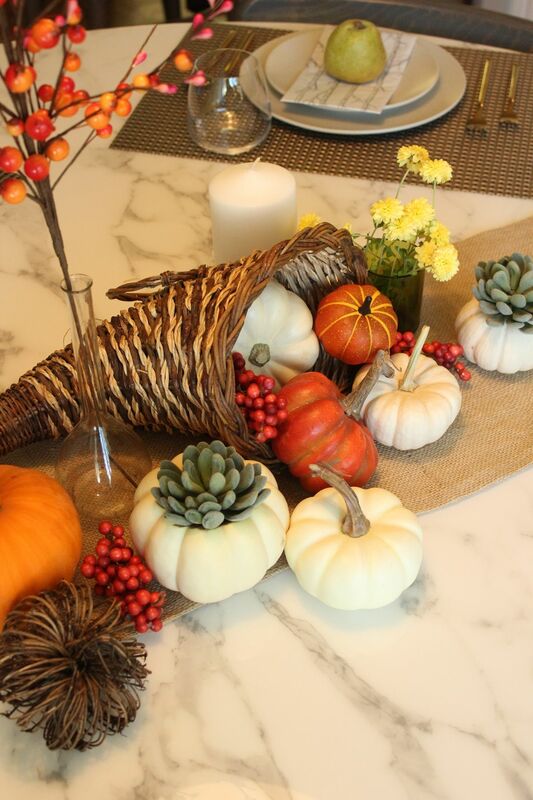 Most centerpieces benefit from some variation of height; this centerpiece is very visually heavy on the right side, at the mouth of the cornucopia. 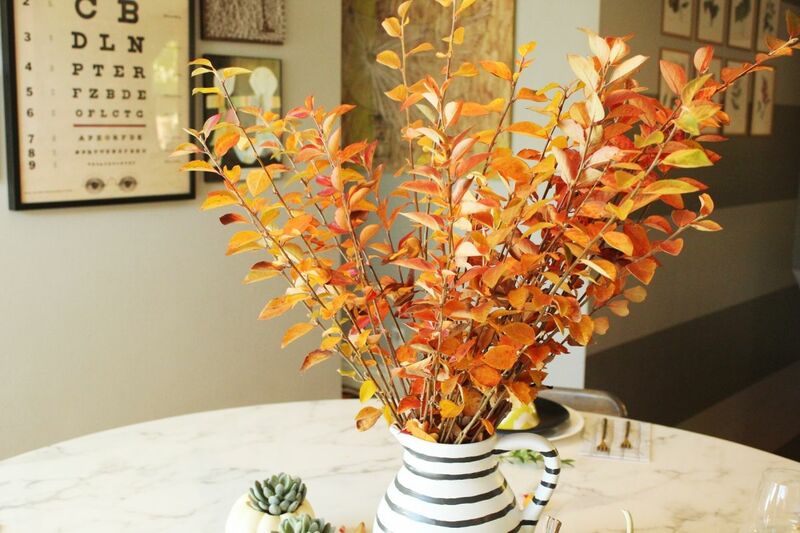 So it makes sense to add some sort of visual weight to the left side, and that comes in a very tall, slender, yet colorful fall-time berry pick in a vintage glass test tube-turned-vase. 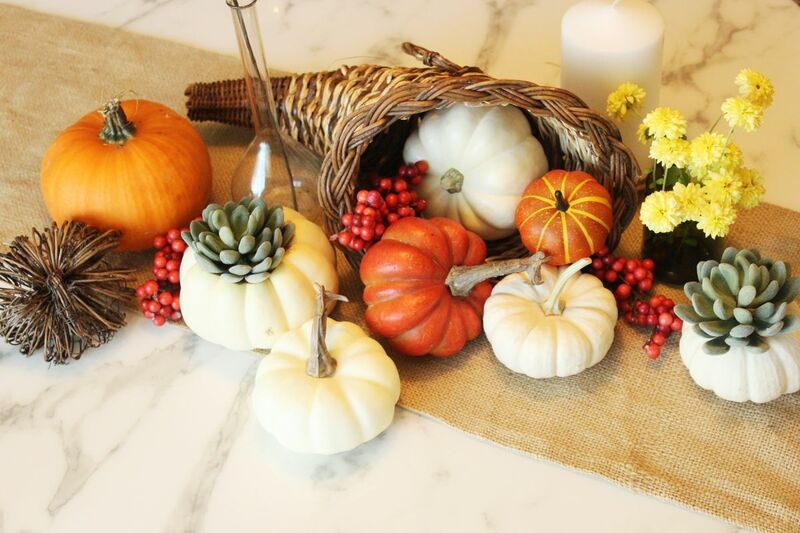 Even on a marble tabletop, this Thanksgiving centerpiece feels warm, textural, organic, and all the good feels of home. 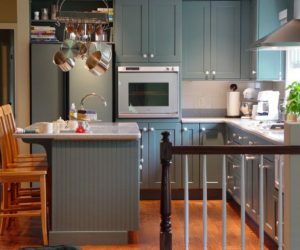 You can stick with a classic color palette, but perhaps you want to freshen things up with a variation on the use of dishes. 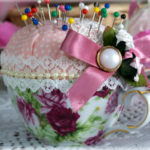 A pretty finger bowl, for example, can be turned over so the exterior is seen (and appreciated). Top it off with a pinecone, if you’re feeling particularly Jenga-master-ish. 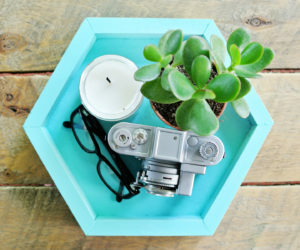 What is the most fun part of a setup like this is having your guests discover some surprise under the upside down bowl. It could be anything! 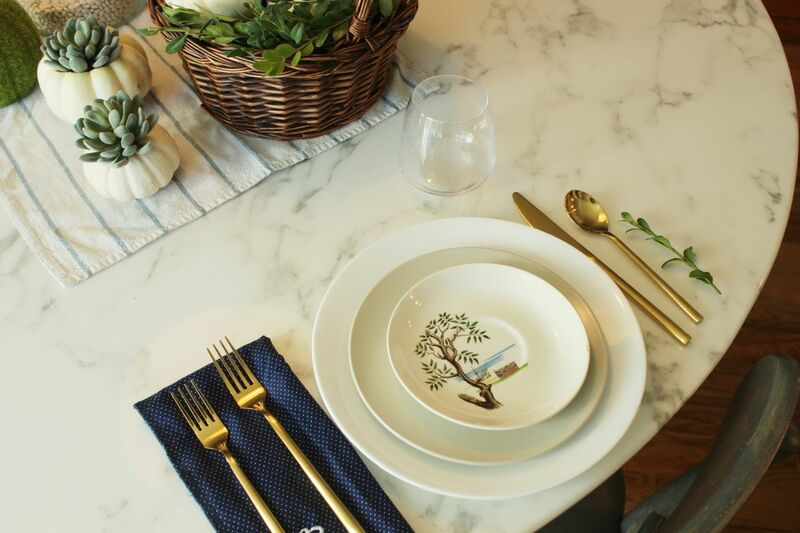 If you feel like a place setting feels a little flat, you can always experiment with a sprig of greenery somewhere around the setting. A green boxwood sprig above the plate, for example, adds a disproportionate amount of life and appetizing appeal to this spot. It should be stated that having at least one matte item at each setting provides a nice balancing touch to all the other shiny components. 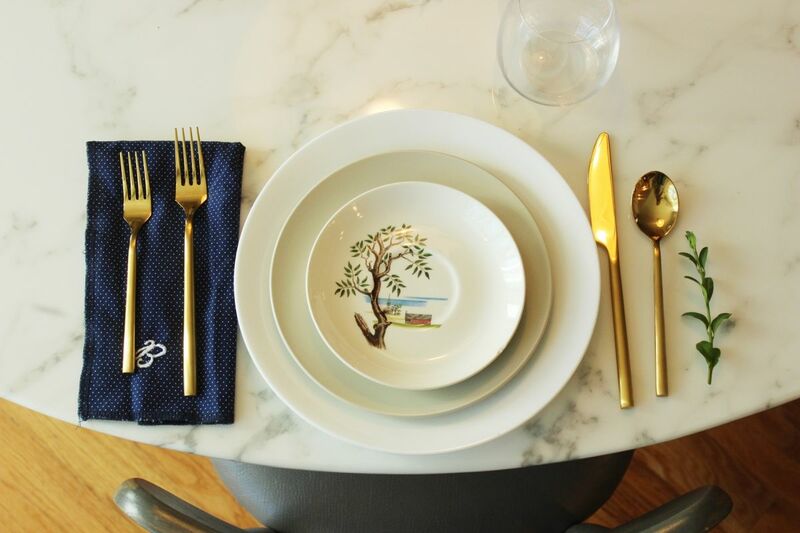 Silverware tends to be gleamy, as does glassware. 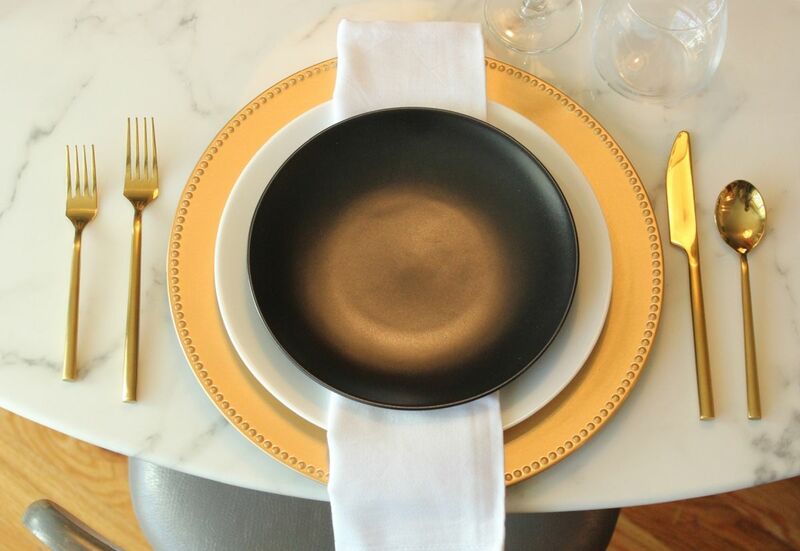 If your dishes all have a shine to them, you might want to consider investing in one smaller matte plate per setting, just to add contrast and an updated aesthetic. Here’s the same simple setup, keeping the boxwood stem. 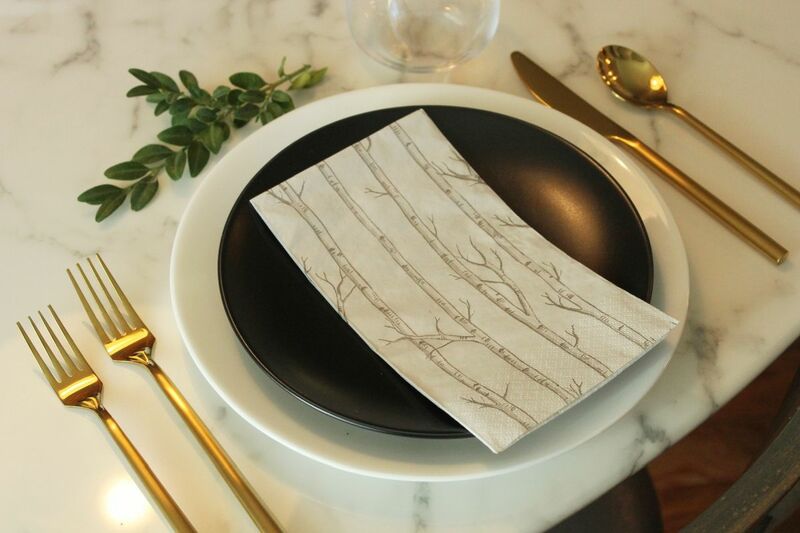 These tree-printed napkins are disposable, which may feel almost blasphemous to some people for Thanksgiving dinner…but it might be the favorite table setting choice for others. 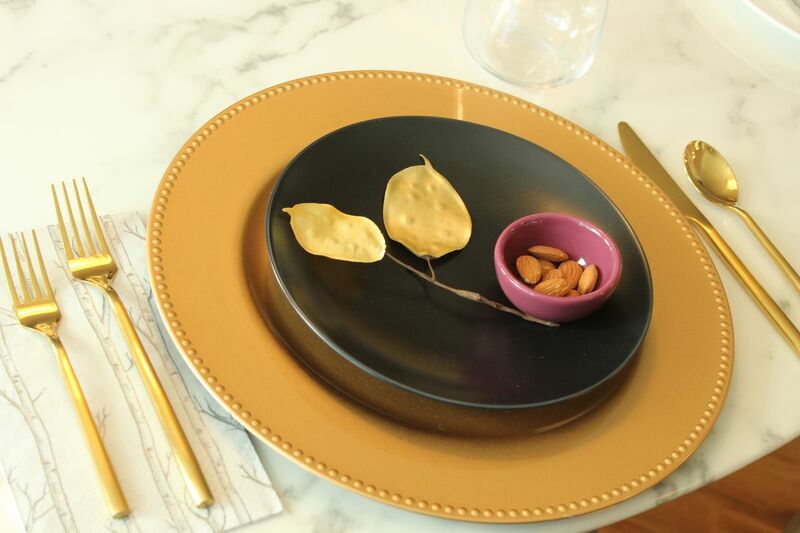 Placing a napkin on top of a dark or contrast plate (in this case, the black salad plate) will help decrease the heavy impact of the contrast color. 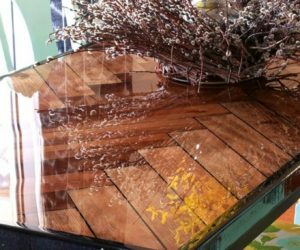 If you like a lighter look and feel when you’re dining, this might be a good option for you. 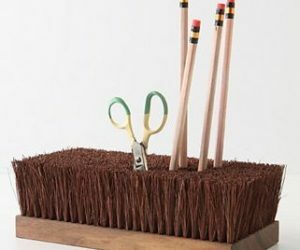 You can get a huge bang for your decorating buck with some clipped branches. These cotton easter branches were clipped from the front yard and shoved into an available pitcher. As the branches were being put into the pitcher, they naturally shed some leaves. 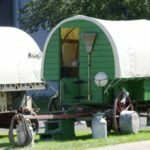 Rather than scooping them up and whisking them away, try letting them fall and letting them be. 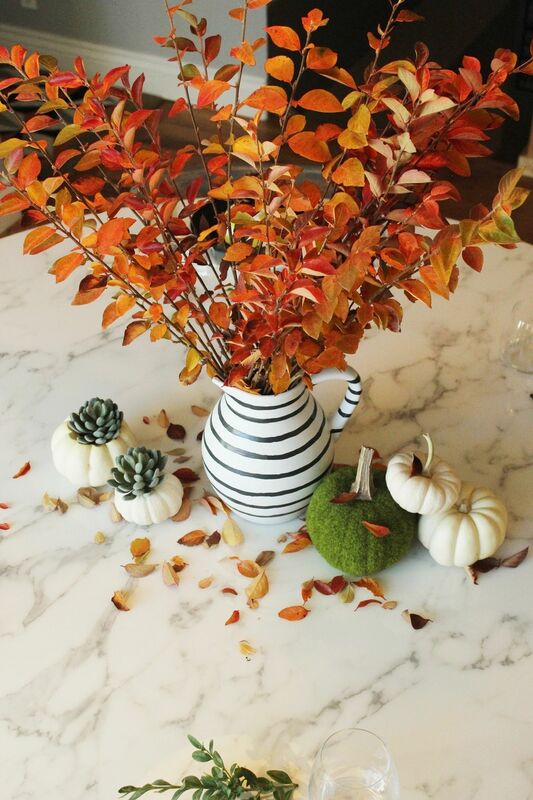 I love the scattered colors of fall here, and the easy, casual vibe of this lovely simple modern centerpiece. And the color gradation from these leaves is like Mother Nature Herself stepped in to help decorate your Thanksgiving table this year. Just gorgeous. 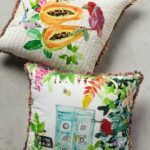 A Study of Plate Décor. 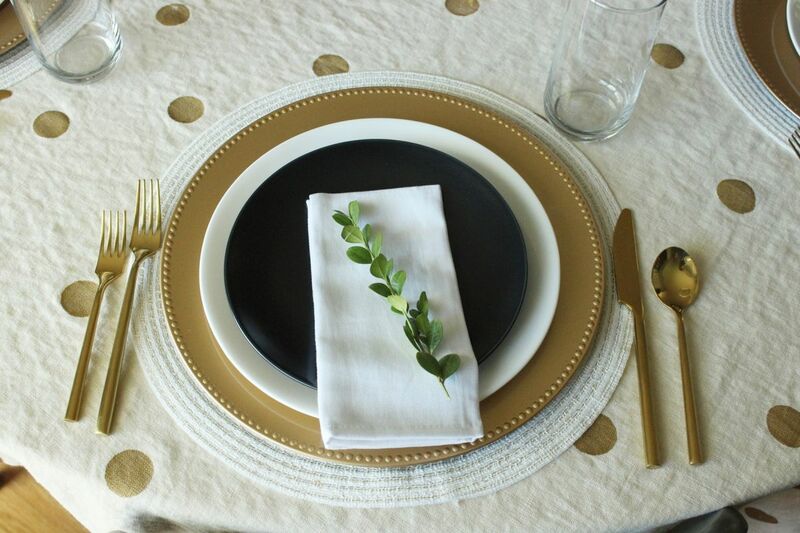 Here is a pretty standard, simple place setting. 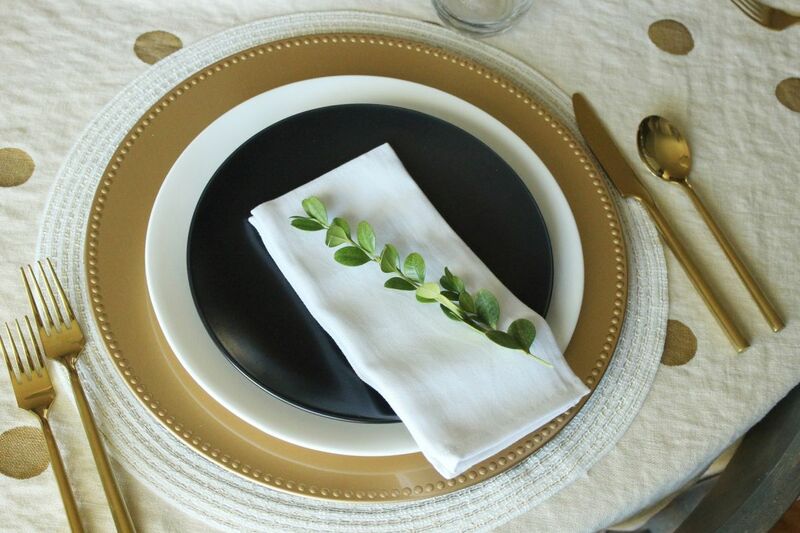 Gold flatware, glass cup, white dinner plate, natural linen napkin, and black salad plate. 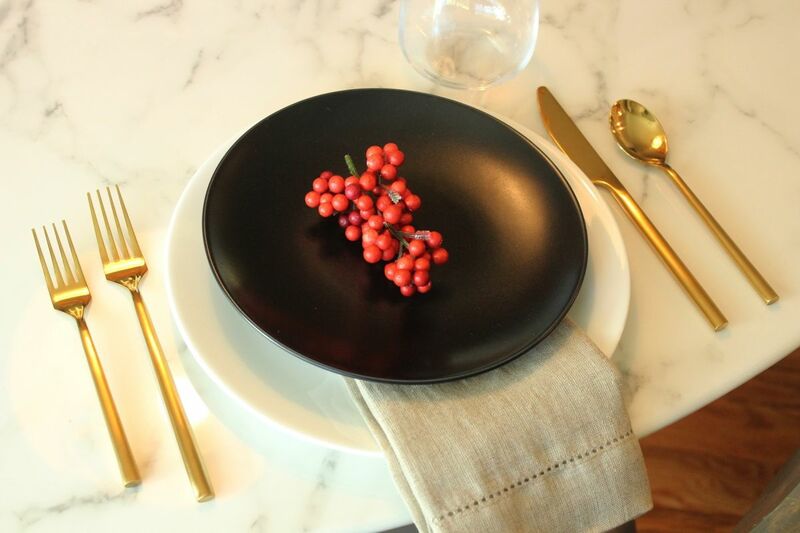 On this plate, a red berries pick sits colorfully. On this identical plate, a boxwood sprig sits naturally and organically. 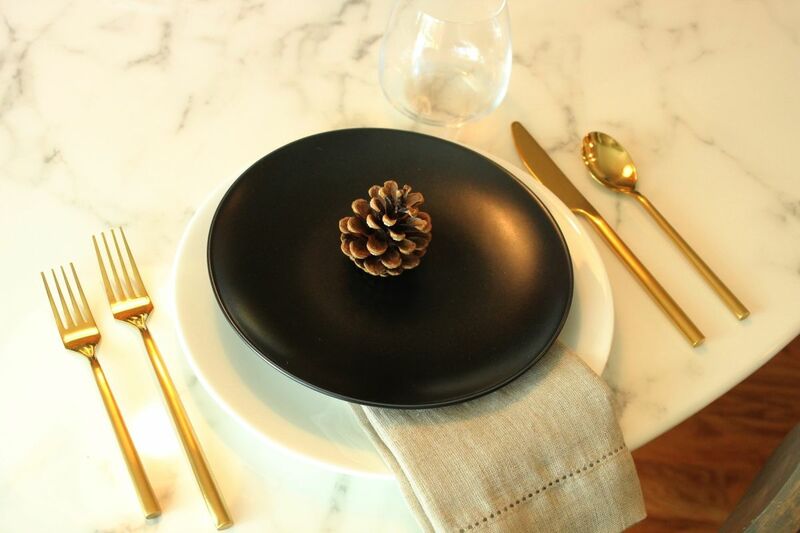 On this plate, a pinecone sits…well, kind of lamely, if I’m being honest. 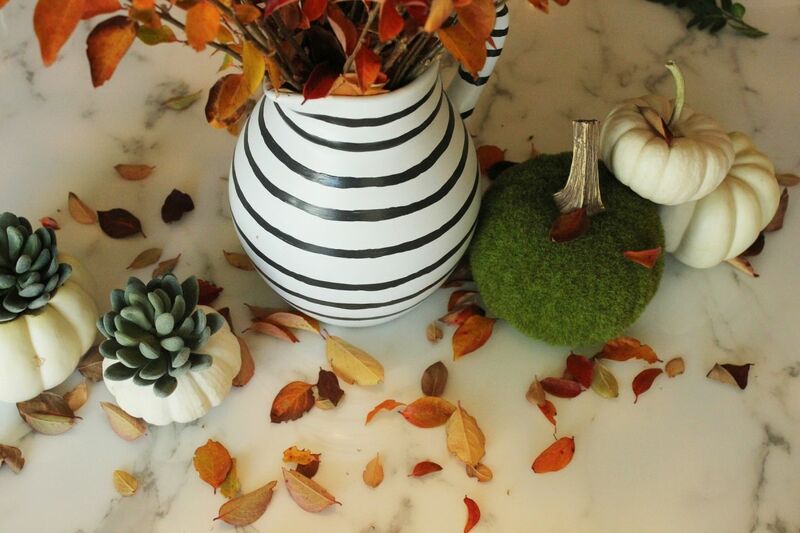 You can combine two of those items (or other similar nature-inspired items of varied fall colors), or even all three. 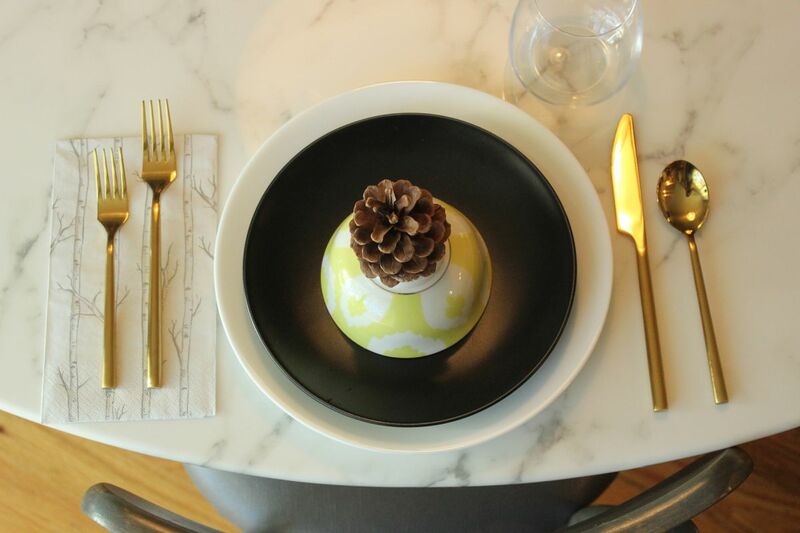 All of a sudden, you have a full plate that looks quite beautiful as a table decoration. A Study of Napkin Placement. 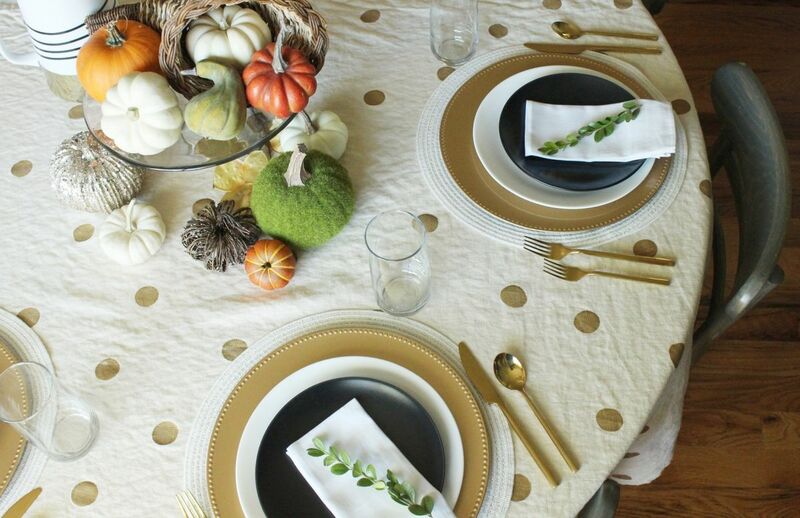 Another variation you can make to your Thanksgiving table setting (that costs nothing!) 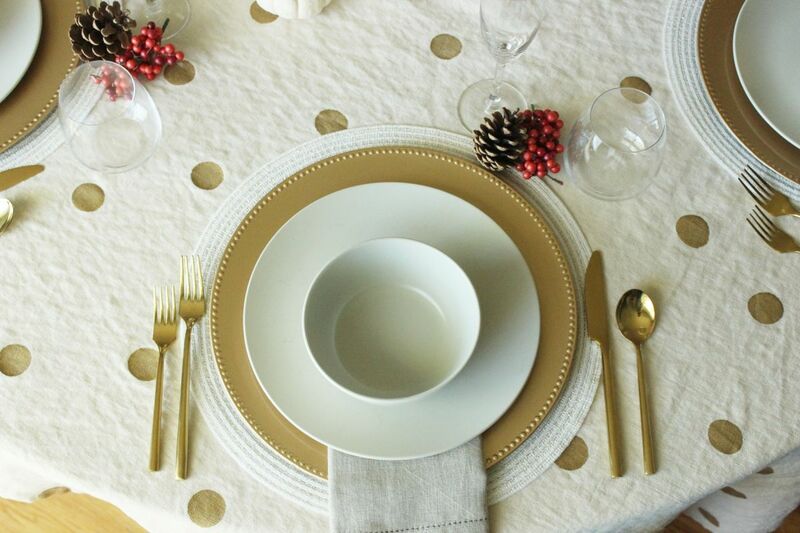 is the placement and position of your napkin. 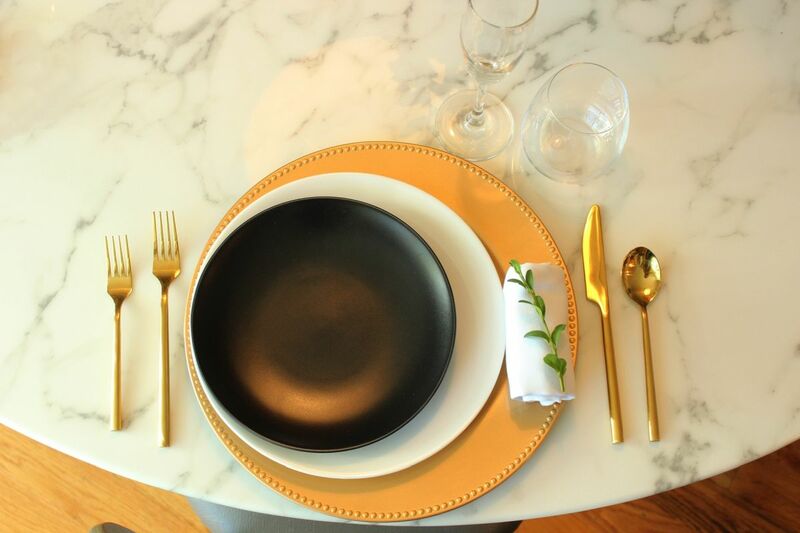 In this place setting, a gold platter plate is topped with a white standard Corelle plate, followed by a matte black salad plate. The napkin is folded in fourths lengthwise, and laid beneath the salad plate only. 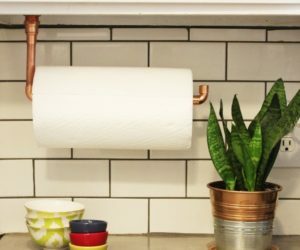 You don’t want the napkin to be too buried, though, as it will make things harder for your dinner guests to fish out a napkin underneath three plates. 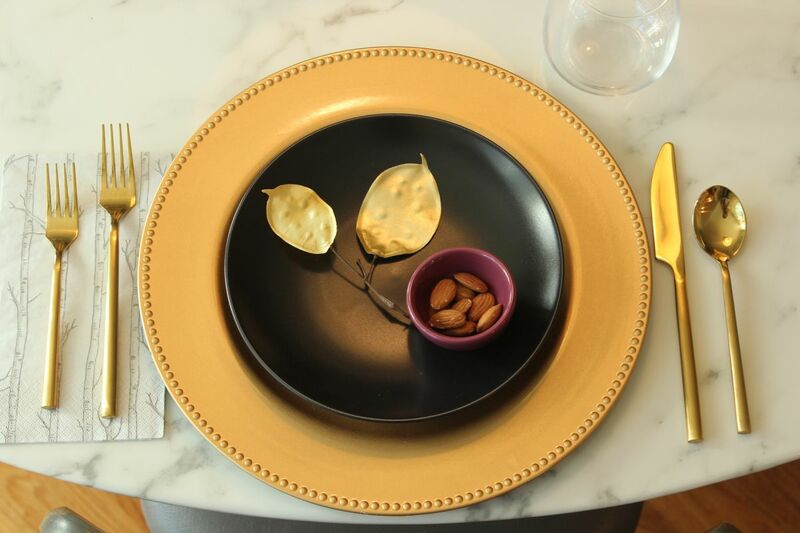 In this place setting, the plates are shifted to the left (a fun contemporary sense of asymmetry). This frees up some space on the right for a rolled-up napkin. 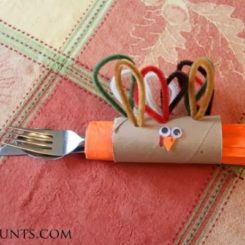 Super simple, but unique enough to delight dinner guests and make them feel really special at your Thanksgiving table. 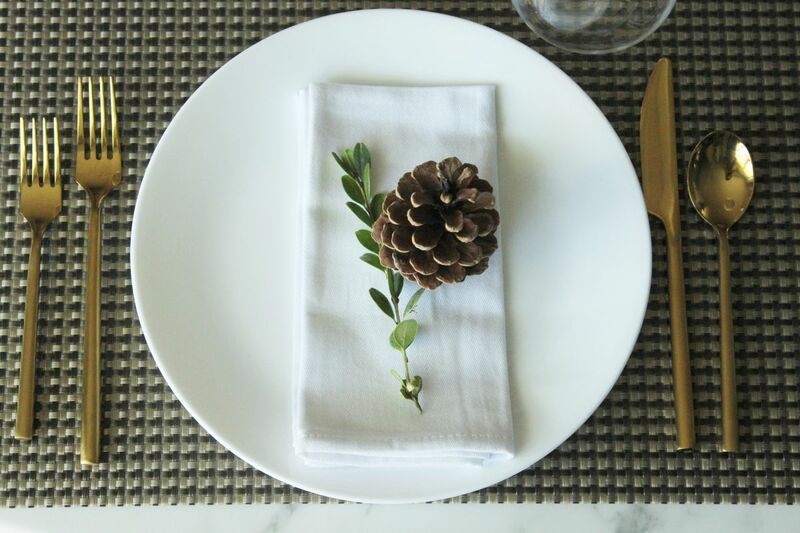 At this simple place setting, a natural linen napkin is folded normally but laid sideways across the topmost plate. 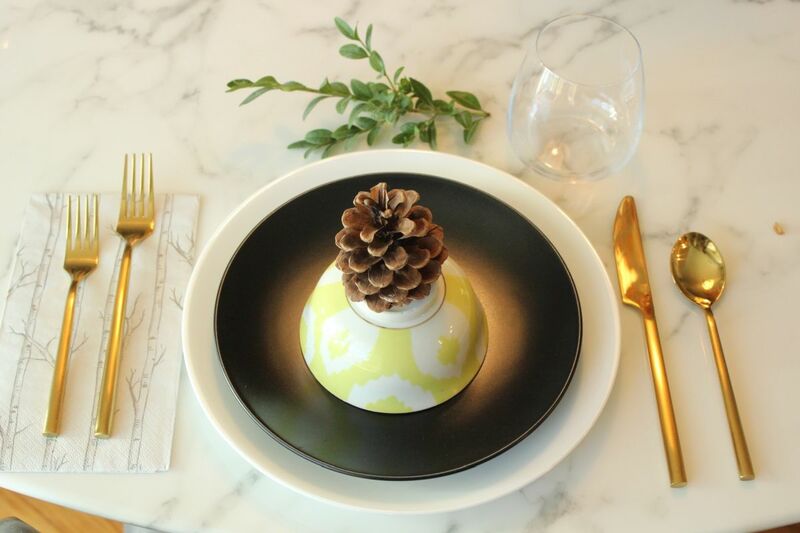 And, because by now you have become accustomed to by borderline obsession with pinecones and boxwoods, you’re not surprised to see those two items resting on top of the napkin. 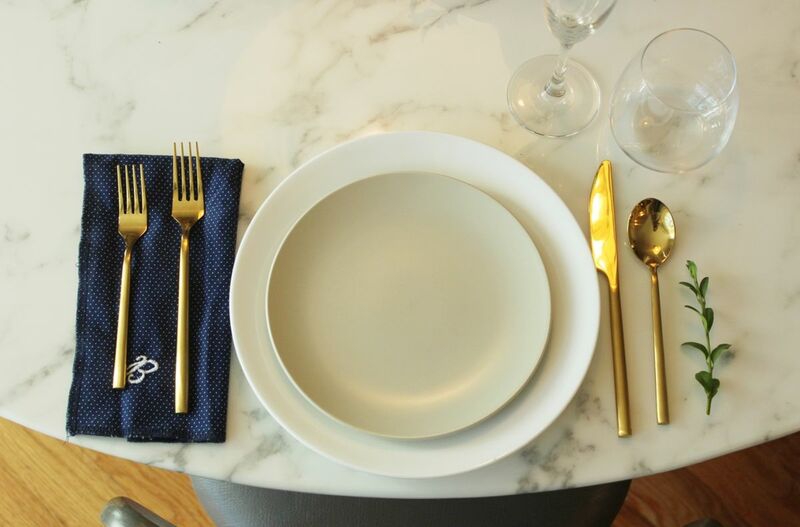 Finally, you can place the napkin beneath the fork(s) lying on the left side of your plate. 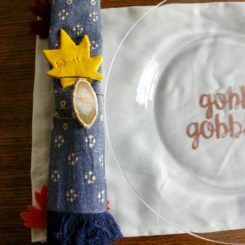 This is standard but works well with a patterned and/or monogrammed and/or otherwise print-special napkin. This napkin is part of a set monogrammed by my grandmother. 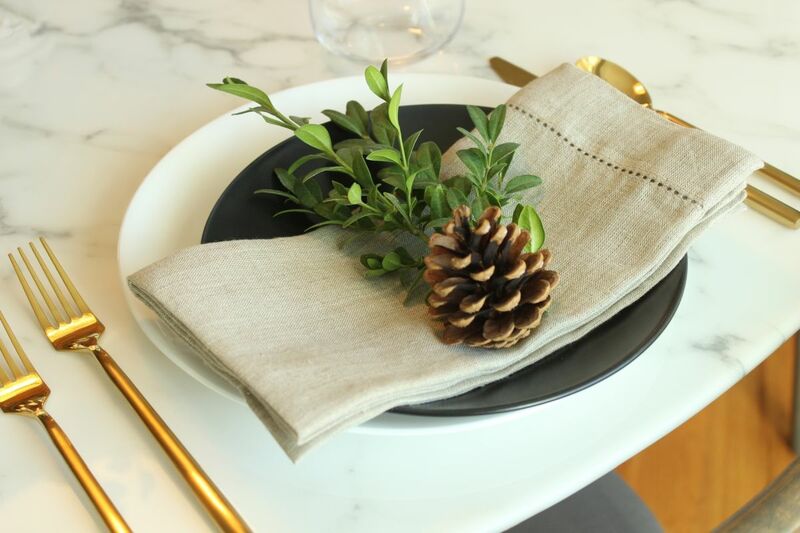 I don’t like the napkins all that much, but if you find yourself in a situation for Thanksgiving that certain pieces should be used because they would mean a lot to your guests, I recommend finding a way to make them work. 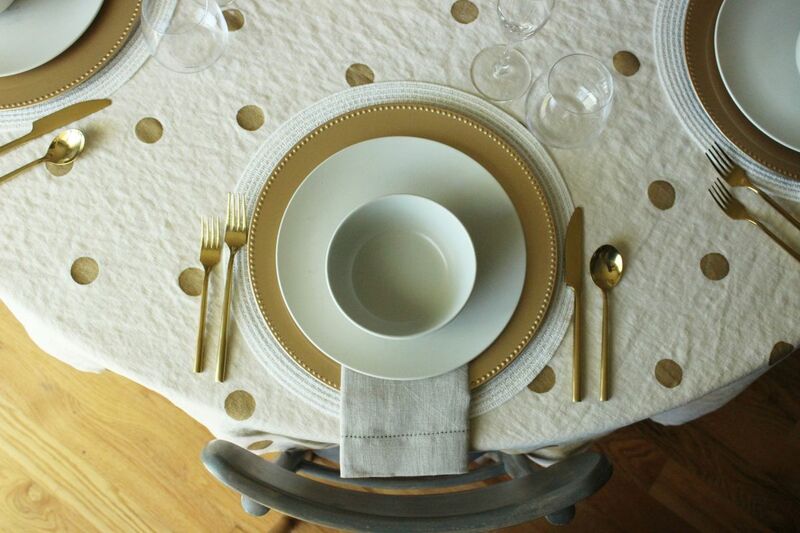 In this case, the navy napkins are balanced with (surprise!) 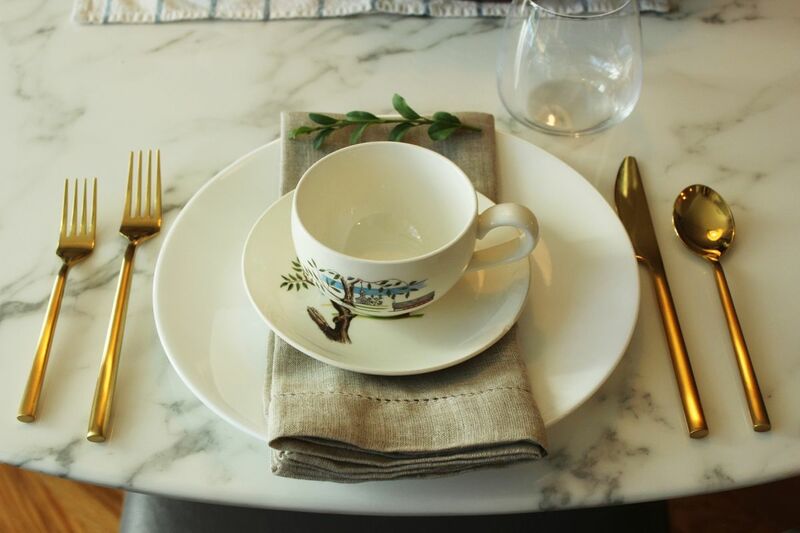 a boxwood sprig placed outside the spoon, as well as a hand-painted saucer plate. Which is also part of a family heirloom china set. 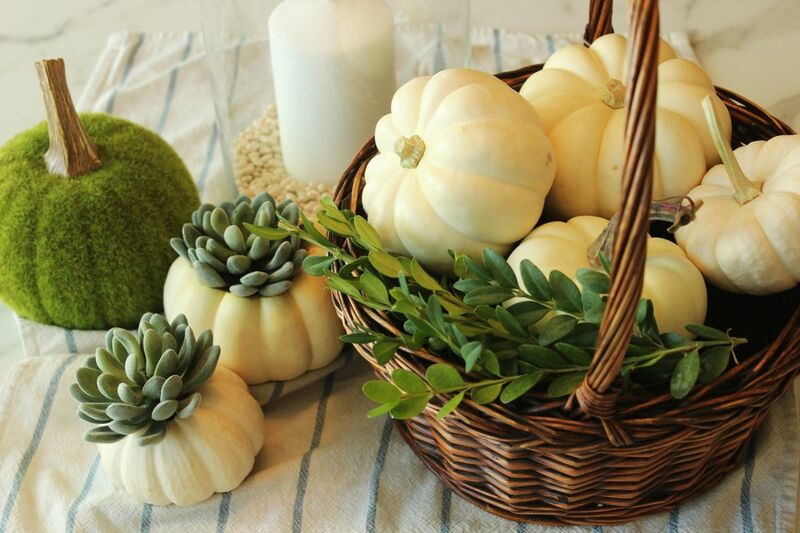 This centerpiece goes to show that if you’ve got access to a couple of pumpkins, an old dish towel, and a basket, you can create a lovely Thanksgiving centerpiece. A chunky white candle surrounded by small white beans in a straight glass vase feels farm-ish, but in a slightly dressed up way. And some greens in the basket go a long way to helping it feel like part of the group and soften the transition a bit. 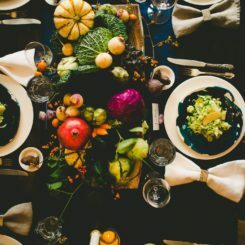 So, with a modern farmhouse centerpiece, this Thanksgiving table setting that includes significant familial components not only makes sense, but it also helps everything rise to the occasion and feel simultaneously fresh and historic. 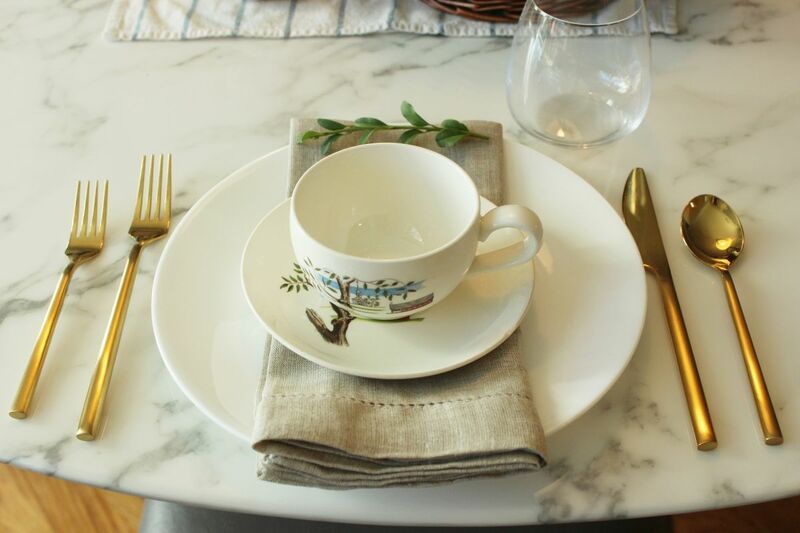 It doesn’t make a terrible amount of sense, to include a teacup in the center of your place setting before the meal has begun, but when you have china, you may as well use it. Fine china begs linen, if you can swing it. What can I say? 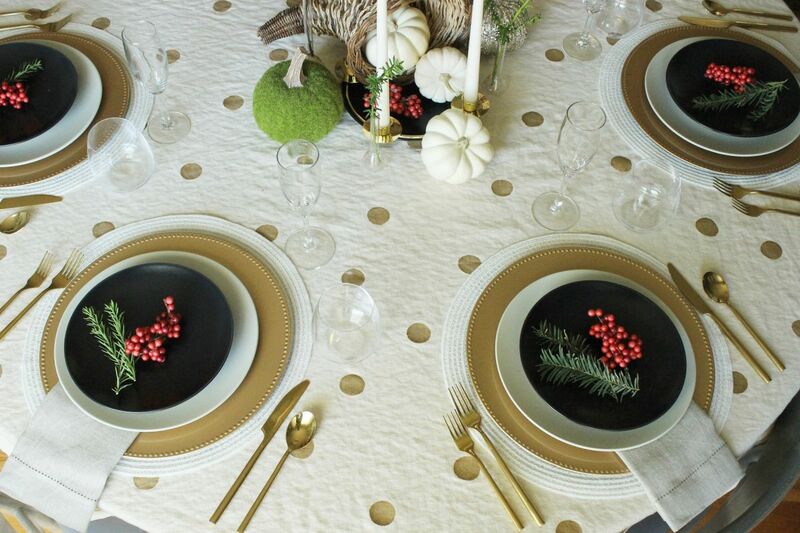 Gold and black is highly dramatic and glam. 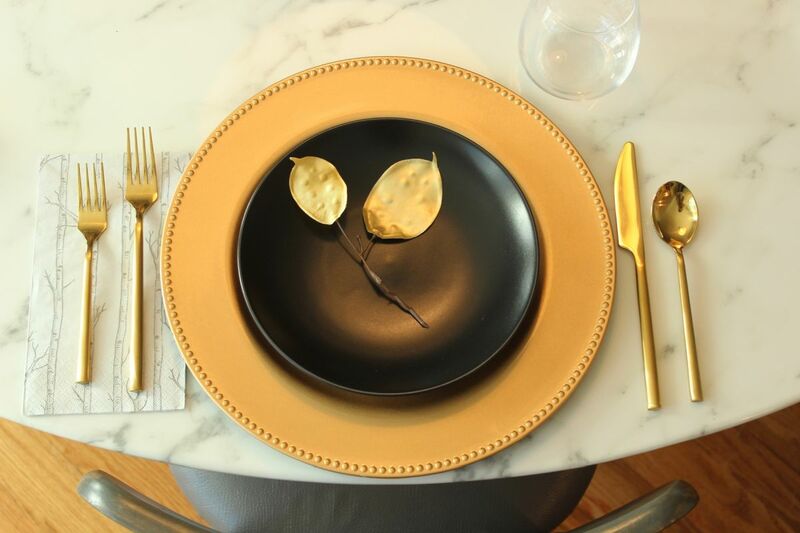 This is especially apparent when the gold part is as visible as this gold platter plate, flanked by gold flatware. 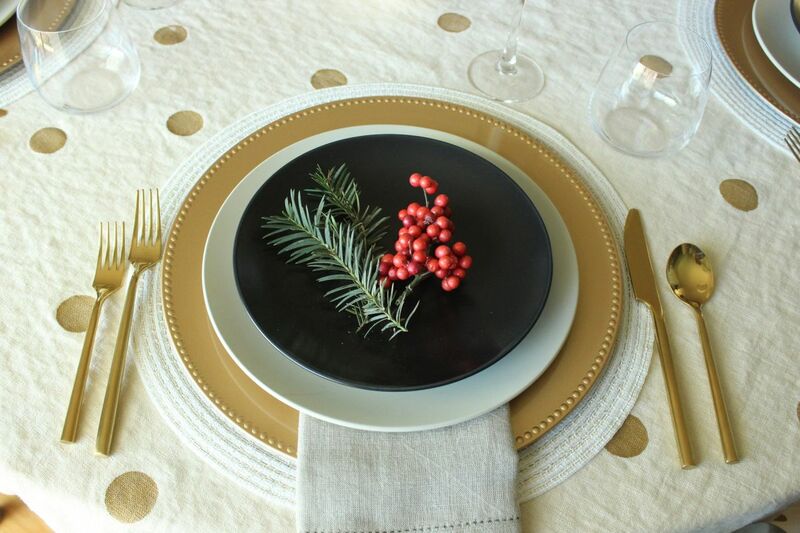 I love the idea of including something small yet edible on the plates themselves. Almonds in a pinch pot, for example, look well but also provide a lovely pre-feast snack while your dinner guests chat amongst themselves. 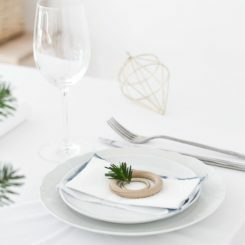 Plus, they grow on trees, which are printed on the dinner napkins, so everything comes full circle and works together to create a beautiful whole. 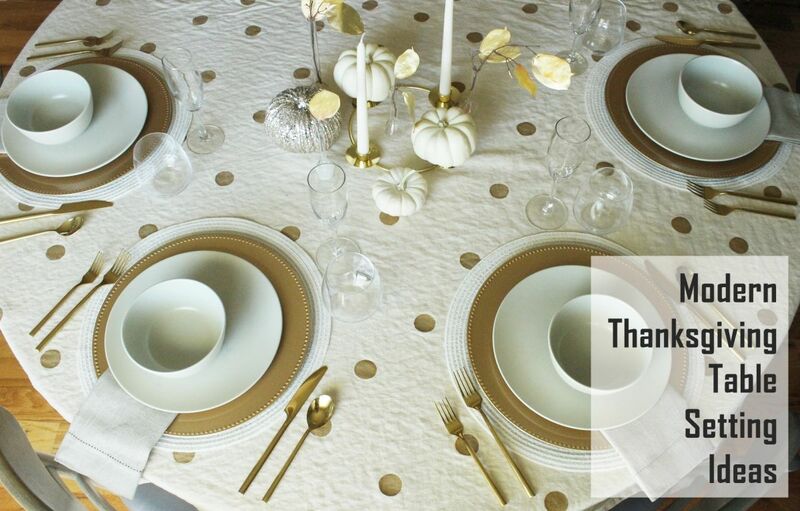 However you choose to decorate your Thanksgiving table this year, we hope that your dining experience will ultimately be adorned with good food and even better company. Happy Thanksgiving.